Be the boss in this fast-paced card game of survival on the mean streets. 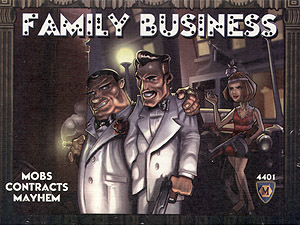 Family Business pits mobsters against each other - all working to make sure theirs is the last family standing! Your gang members get placed on the Hit List. Can your "Family Influence" save them? Will they "Take it on the Lam," seek "Police Protection," or perhaps up the ante with a "Double Contract"? Family Business is fast, furious, and fun! Your goal is survival! What's in the cards for your gang?